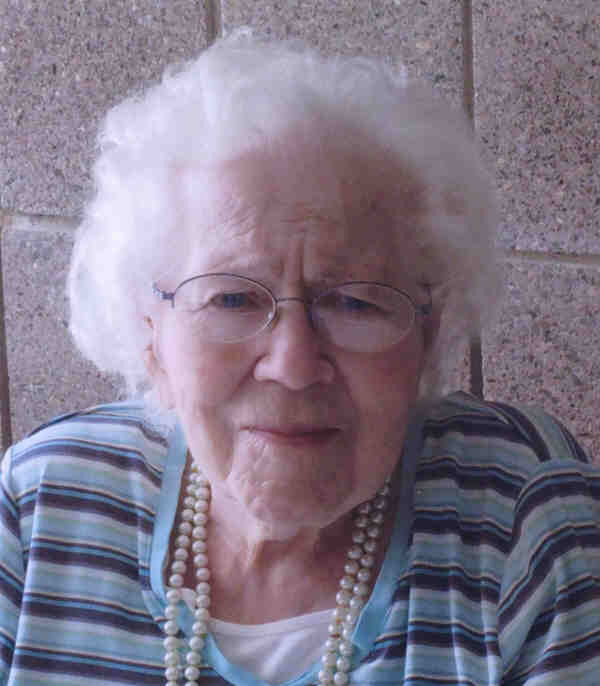 Glenys (Mrs. Jack) Aldrich, age 98, of Faribault, died March 1, 2012 at St. Lucas Care Center, Faribault. Glenys Marian Neubauer, was born December 5, 1913 in St. Paul. Her father was first a brakeman and then a conductor on the railroad. This led Glenys to have a life-long love of trains. When Glenys was about five years old, the family moved to St. James. MN. She graduated from high school there at the age of 17 and went to college in Mankato. Two years later, she began her teaching career at Morristown High School. There she also led the "Glee Club". In 1937, Glenys married Delbert (Jack) Aldrich. Together they ran Aldrich Grocery and had four children. When the youngest child was three, Glenys resumed her teaching career. She taught in several country schools and then elementary school in Dundas. As she continued with higher education, Glenys obtained her masterÕs degree, was the Principal at Dundas and then taught Junior High English at Northfield and Faribault Schools. During her life, Glenys loved horses and music. She led choirs in various Methodist churches over the years and could play the piano either with music or "by ear". To do this, she would chord with the left hand and taught others to do this as well. She traveled to many countries after her retirement and lived in various places including Westcliffe, CO and the San Diego, CA area. The last nine years of her life, Glenys moved back to Minnesota. Living at Deaconess Tower and then at St. Lucas Care Center, Glenys would reminisce with many about her 98 years of life. Those who passed before Glenys include her infant daughter, Samantha in 1939; husband, Jack, in 1973 and son, Tod in 2001. Her family includes Jacque (Aldrich) Moon of El Cajon, CA and children Saree, Tod and Curt; Nancy (Aldrich) and John DeCoux of Faribault and sons, Isaac and Julian; Tod's widow, Nancy (Klee) Aldrich of Colorado and Faribault and daughters Susan (and her children, Elizabeth and Tod), Jennifer (and Mark) Warner, and Molly. Glenys has made the request to have no funeral service. She asks that people remember her as she was. Glenys was such a wonderful ray of sunshine - I was able to visit with her a few times at St Lucas when I went to visit my grma N. The sparkle in her eyes and in her smile always lit up everyone around her! Her talent at tickling the ivories was enjoyed by many throughout her time on this earth - I know the folks at St Lucas appreciated it! She will definitely be remembered fondly by everyone who knew her. God is enjoying her gifts first-hand now. Our prayers go out for her family in this time of great loss. She lived a very full life and this world was a better place because of her.